Prepare old-fashioned oatmeal according to package directions; add sprinkle of cinnamon to pot in last minute or so of cooking. Meanwhile, melt butter in a large skillet over medium heat, add brown sugar. When sugar is almost fully incorporated with the butter, lay apple slices in pan, coating one side slightly before turning and allowing to cook for approximately 2 minutes. Flip slices again and add almonds, tossing with sugar mixture to coat. Continue cooking until apples appear slightly caramelized and softened, about another minute or two. 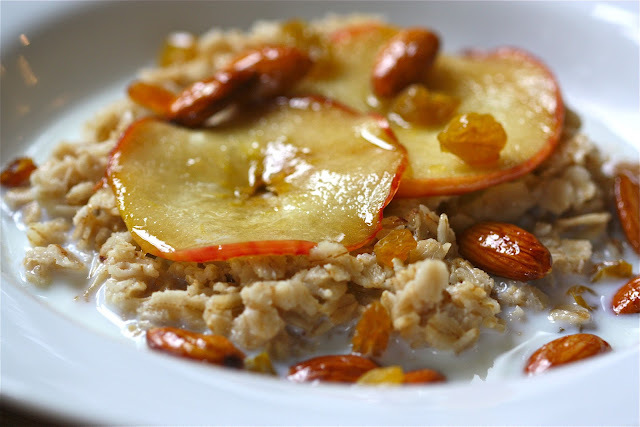 Plate oatmeal, lay a few apple slices over top and sprinkle with some almonds and golden raisins. Return skillet to heat, add 1 teaspoon water to deglaze pan. Remove from heat and drizzle bowls of oatmeal with a little of the pan syrup. (note: I think deglazing pan after you remove the fruit and nuts will prevent the nuts from becoming soggy or losing their beautiful sheen.) Finish with a some warm milk, poured just around edge of oatmeal. Serve immediately.